Fishin Oregon specializes in Salmon, Steelhead, and Trout fishing on the Rogue River. Our staff of seasoned guides are experts in a variety of fishing techniques: fly fishing, spin casting, bait bouncing, and pulling plugs. All fishing rods and tackle as well as bait and flies are furnished by the guides. In order to provide the kind of individual instruction we prefer, there is one guide per boat, and each boat holds up to three fishermen. Our McKenzie-style drift boats are truly the "Rolls Royce" of river craft. Passengers relax in the luxury of comfortable bucket-type seats with back & arm rests. The guide sits behind where he can give instruction and watch the rod tips for the tell-tale bite. If you are looking at a truly lifetime adventure Fishin Oregon offers four day three night drift boat fishing trips down the "Wild & Scenic" Rogue River Canyon. These trips are all inclusive lodge trips that cover almost 60 miles of whitewater and amazing wilderness. 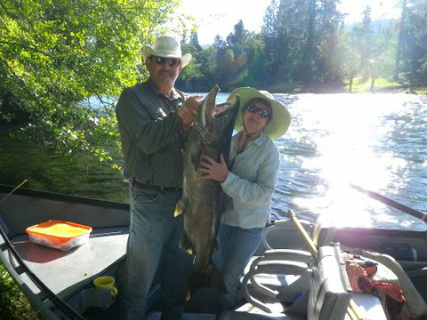 The crew at Fishin Oregon can provide you with an unparalleled river experience. Day fishing trips are available on other rivers as well such as the Umpqua River, Which has an amazing Winter Steelhead run and some non stop Smallmouth action during the summer. The Chetco River where you can hook into some monster Chinook Salmon (Kings) in the Fall. As well as the Upper Klamath River which offers some great fly fishing for native Red Band Trout. We also offer our popular Rogue River BLAST & CAST during the fall hunting season. Please don't hesitate to inquire about any of our trips you may be interested in we would be more than happy to answer your questions. - Comfortable boat seats and heaters for those cold days. - Rods, reels, all terminal gear and bait when needed. - Licensed courteous, patient, knowledgeable guides to teach you. - Lunches provided upon request for a nominal fee. - We can arrange lodging accommodations for you. - All fish are cleaned and bagged for you at the end of the day. - Layered clothing to adjust to variable weather conditions. - Rain gear if needed. - Any personal items: sunscreen, camera, hat, sunglasses etc. - Beer and/or wine if desired.